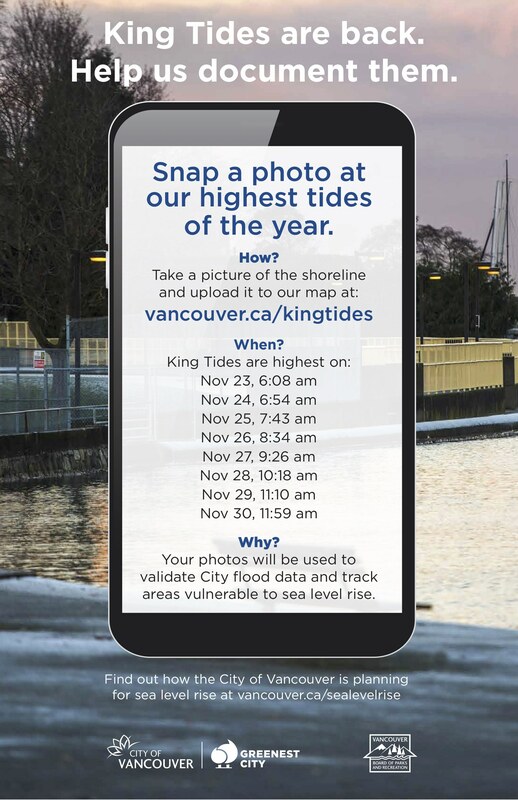 The City of Vancouver is looking for support from the community this King Tide season (November 23rd-30th), to help document the high water mark. King Tides are the highest tides of the year and with contributions from the community, we can help the City of Vancouver visualize what the shoreline might look like as sea levels rise due to climate change. The collected photos will help the City validate flood models in order to better prepare for the impacts of sea level rise. Participate by snapping your own photos of the shoreline! Upload it to The City of Vancouver Website and be sure to include the date & time your photo was taken! By clicking here you can find more information on King Tides and how to support this year’s campaign.